Alex has spent a lifetime in the sewing industry and is considered one of the foremost experts of pioneering machines and their inventors. He has written extensively for trade magazines, radio, television, books and publications world wide. Over the last 35 years Alex has been painstakingly building this website to encourage enthusiasts around around the Globe. How many of history's great characters can really say they changed the world? 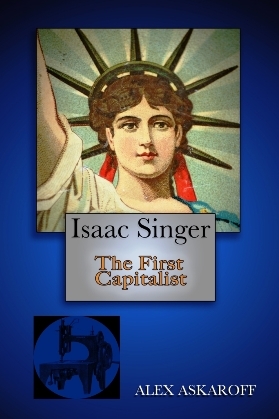 One man that did was the son of a Jewish immigrant, Isaac Merritt Singer. He pursued the ultimate rags-to-riches dream and made that dream a reality, building castles and palaces along the way. For the first time pain staking research, over two decades, has brought the fascinating story of this forgotten giant to life. 1873 The prize winning Princess of Wales. Claimed by periodicals of the day as the most perfect hand machine yet invented! 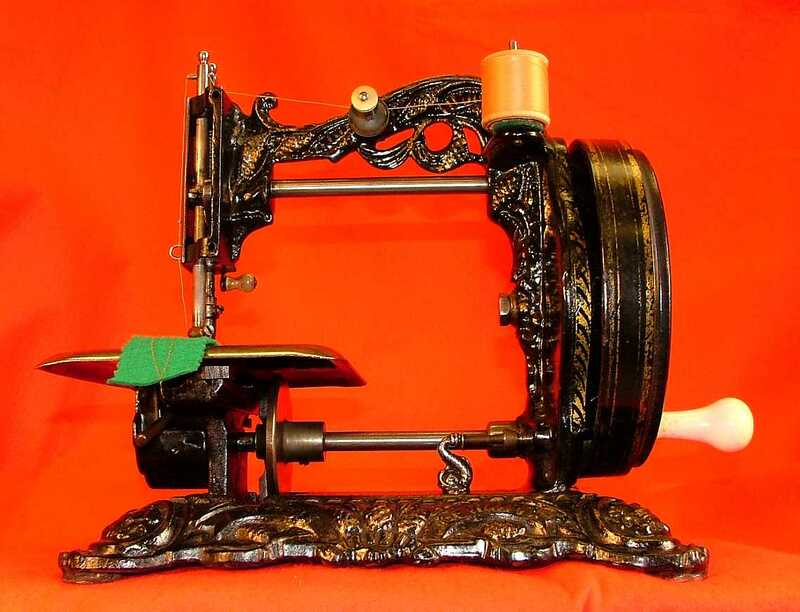 One of the most beautifully ornate and decorative cast sewing machines of the Victorian Era was the Princess of Wales sewing machine made by Newton Wilson of England. Newton Wilson has been acclaimed as one of the main founders of the British sewing industry which is a bold statement but his fabulous Princess of Wales sewing machine certainly ticks all the boxes for collectors. 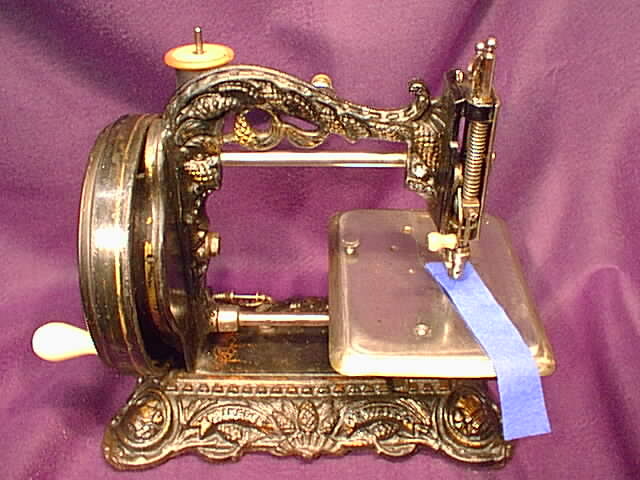 The machine was made to look at home on a lady’s parlour table in Victorian England. Produced by the pioneer and genius William Newton Wilson. Can you see the little dolphin bobbin winder on the machine above? It was this attention to detail that made the Princess of Wales a sought after machine. However it was ten times more expensive than the James Weir machine of the same period! In the long run it was doomed to failure simply because it was too expensive. Priced out of the market as too expensive that Princess of Wales is still one of the most sought after machines of the Victorian period by collectors worldwide. An Early model Princess of Wales MKII sewing machine. There were three distinct models of the Princess of Wales this is the second model, MKII. It was a case of the ugly duckling later turning into a swan. 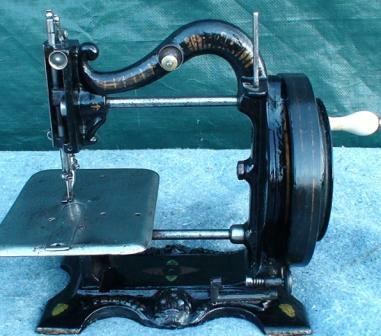 This model did not sell well and although is much rarer does not fetch the price that Newton Wilson's later Princess of Wales sewing machine does. You can just see the centre three feather on the base. Later these were on each corner. 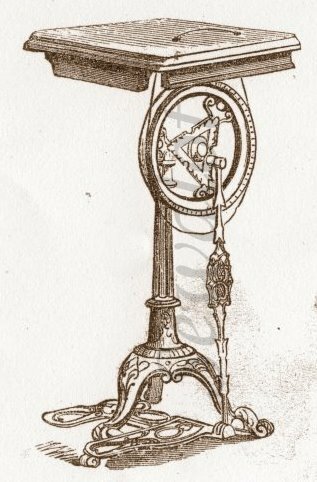 Newton Wilson’s trademark, the three feathers of the Black Prince, were later cast into the corner of each machine base. By 1857, Newton Wilson was selling sewing machines from 144 High Holborn, London. 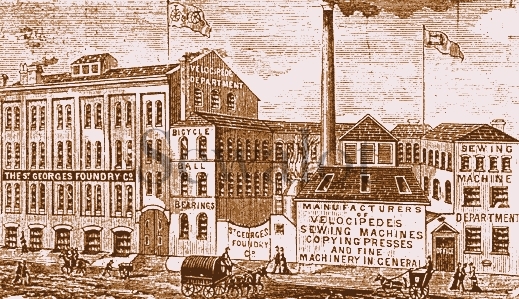 Like many of the early European sewing machine suppliers he imported from America. America was a decade ahead of the rest of the world in sewing machines. 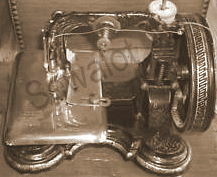 The heavy looking Newton & Wilson sewing machine of 1859-60. Before the Trades Description Act was brought in, you could basically say what you liked about the goods that you sold. Newton Wilson was no exception, calling the Grover & Baker sewing machines that he supplied as his own. Unfortunately with personalities like Elias Howe and Isaac Singer suing everyone who even thought about making their own sewing machines, when Newton Wilson did make his own machines, he ended up in court. Legal proceedings plagued Newton Wilsons commercial life but it did lead to one very interesting find. Notice this early advert for the Princess of Wales MKI. 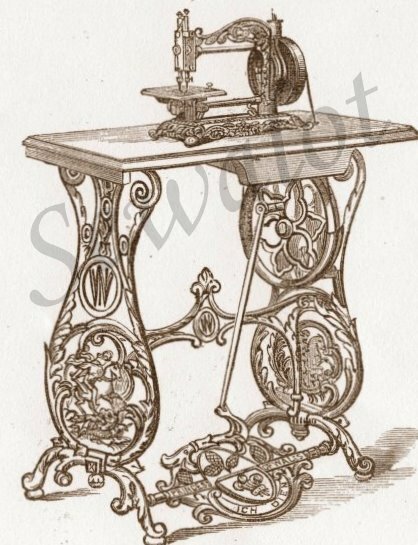 One day as Newton Wilson was sifting through the endless patents at the Patent Office when he stumbled upon the Thomas Saint sewing machine patent of 1790 that had been misfiled. 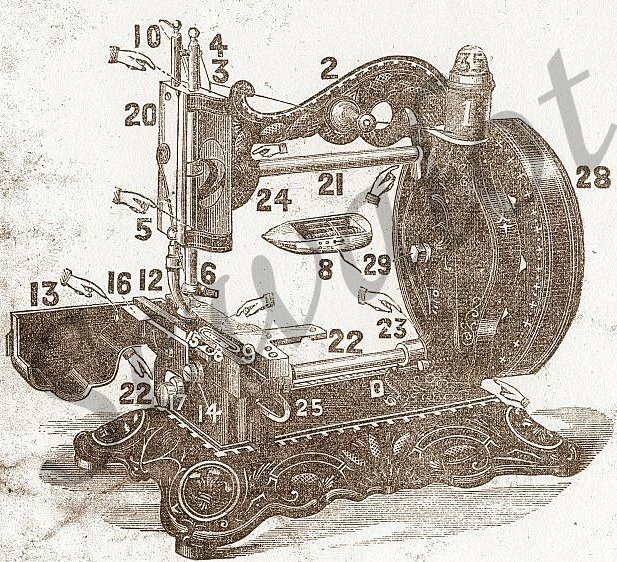 The Thomas Saint Patent had vague similarities to the Elias Howe Patent in America being a machine for stitching leather, though it was a chain stitch machine. 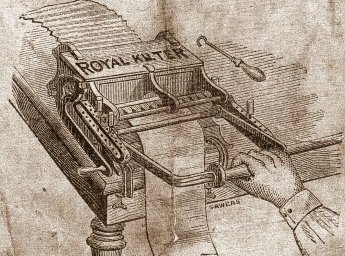 in 1874 Newton Wilson took the patent plans of Thomas Saint's and with a little modification actually made the machine stitch. A super rare Newton Wilson Queen Bess sewing machine. Had that patent shown up at the Singer-Howe court cases Elias Howe may have lost his claim to have invented the first sewing machine using his special needle. In fact if many details had turned up Elias would have lost. For example sometime before Elias Howe had patented his unique needle in America John Fisher had patented something similar in England. That would in turn have cost him the fortune that he made from sewing machines. Elias Howe became one of the richest men in the world and hardly made a sewing machine. His history is well worth a read. The Princess of Wales monopod is so rare that I have never seen a real one! By 1867, Newton Wilson had set up his works at 52 Pope Street Manchester. 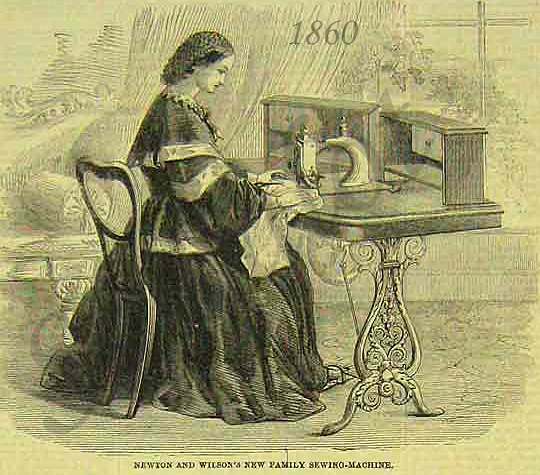 The Princess of Wales sewing machine, Wilson’s most famous sewing machine, was initially forged at one of Wilson’s factories in Woolpack Lane, Nottingham along with some of the most sought after sewing machines in the world, including the Queen of Scots and the stunning Cleopatra. The foundry also produced the kilter which as you can see pleated fabric. At the St Georges foundry they made bearings, bicycles or velocipedes, tools, presses and most importantly sewing machines. The Pope Street, St George's Foundry. Note the various huge advertising on the walls and the small sewing machine department on the side almost as an afterthought. To produce these fabulous machines Wilson brought together the greatest team ever assembled in the sewing machine world. They included James Starley who later produced the amazing Queen of Hearts sewing machine, the needle specialist A. J. Baylis, William Singer and William Hillman. They were all experts in their fields and several went on to form their own businesses. 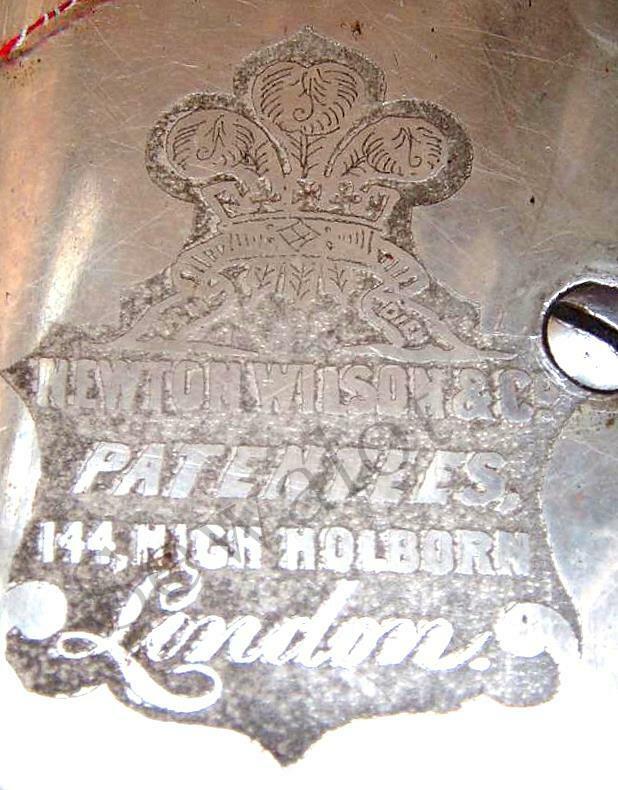 Newton Wilson 144 High Holborn, London, stamped on many of his sewing machines. Their experience was to come together to bring us some of the most stunning British machines we are ever likely to see. 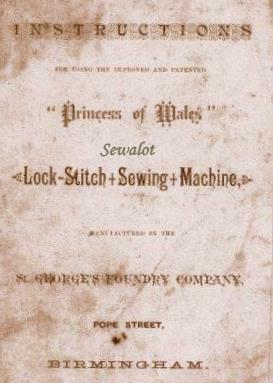 Each Princes of Wales sewing machine was hand built and unique, all parts being stamped with an individual number to identify it. The multitude of oiling points to keep the machine sewing. Don't you love the little dolphin that acts as a bobbin winder? It's these tiny details that makes the Newton Wilson Princess of Wales one of the most collectible sewing machines on the planet. Note also the Prince of Wales three feathers on each corner. In 1873 The Princess of Wales,won the Grand Medal of Merit at the Vienna show in Austria. At the time, this machine was described as the most perfect hand machine yet invented. Newton Wilson later purchased superb showrooms in the heart of London at 210 Regent Street and 144 Cheapside, London. The Princess of Wales £6.6s (three models plus Wilson rotary hook). The Cleopatra £4.4s Chainstitch (MkI and MkII). The Queen of Scots (shaped in the letter M for Mary). The Queen Mab £3.3s Chainstitch, Hamburg import (Made by Guhl & Harbeck with a Newton Wilson base). Jenny Lind (similar castings to the POW). England's Queen (similar to POW with different base). Wallace Ash (once again a POW with a modified base). England’s Queen (an early zig-zag machine). The Princess of Wales had two main versions from 1870, an early plain casting model MKII and the later spectacular one which we all know and drool over the MKIII. On each corner foot are the three feather of the Prince of Wales that Newton Wilson put on many of his machines and became his trademark. This is a Princess of Wales MKIII that I sold to an American collector in 2005 the closer you look at the Princess of Wales the better the machine is. The attention to fine detail is unsurpassed and a credit to the design of Newton Wilson. 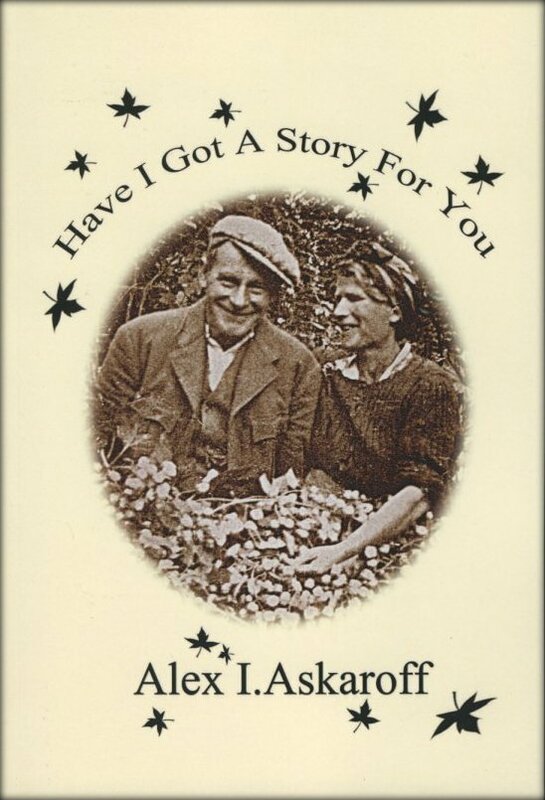 This may just be the best book that I've ever read! J Vincent, Horam, East Sussex. Just wanted to express my appreciation for your website it is a one-of-a-kind database, thoughtful enough to spend hours and hours on ..
You were a great help in my study.. I found your site last night, and have really enjoyed it. It was fun to learn more about sewing machines. Thank you for furthering my education on these marvels.